Have You Heard About Deal Market? 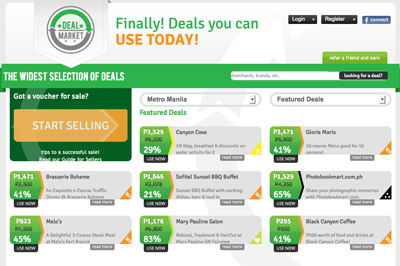 I have a lot of friends who enjoy buying vouchers from various group buying sites in the Philippines. However, there are times when they suddenly realize that they don’t really need what they just bought, or they don’t have the time to claim the vouchers anymore. When that happens, what do you do? The solution is you go to Deal Market – www.dealmarket.ph – the place where you can sell your unused (and unwanted) vouchers and convert them back to pesos. Scenario 1: You just bought a restaurant voucher and you suddenly became busy and you think you won’t have time to use the voucher anymore. Solution: Sell it in Deal Market and hopefully, someone else would be interested to get the voucher and you earn your money back. It can be sold at the same price you bought it, or a little lower to make it more enticing. Scenario 2: You just bought a great limited-quantity item voucher and you thought you could use some extra cash. Solution: Sell it in Deal Market a little over the price you bought it. If the item is already sold-out in the original group buying site, I’m sure there will be someone who would be willing to pay more than the original deal to get that great item. Scenario 3: That travel voucher you hoped you’d get is already sold out on the group buying site. Solution: Browse through Deal Market. Maybe someone is selling their vouchers for that deal. There are a lot of other scenarios I can think of that makes Deal Market a great place to consider if you’re looking for bargains and great deals online. So check it out today. Here’s another scenario: You are looking for a massage or dining deal that you can use right away. How Many Cups of Coffee a Day Can a Person Drink? What is an Ale Beer and a Lager Beer? What’s the Difference? How to Tell if Tea Has Gone Bad? How Long is Tea Good For? What’s the Best Drink to Recover After Sports or Exercise? The Thirsty Blogger. All rights reserved 2010-2019.